You may not have ever thought about making your own vanilla extract, but it’s incredibly easy to do. Why would you want to make your own vanilla extract? Well, it’s less expensive, for one thing. 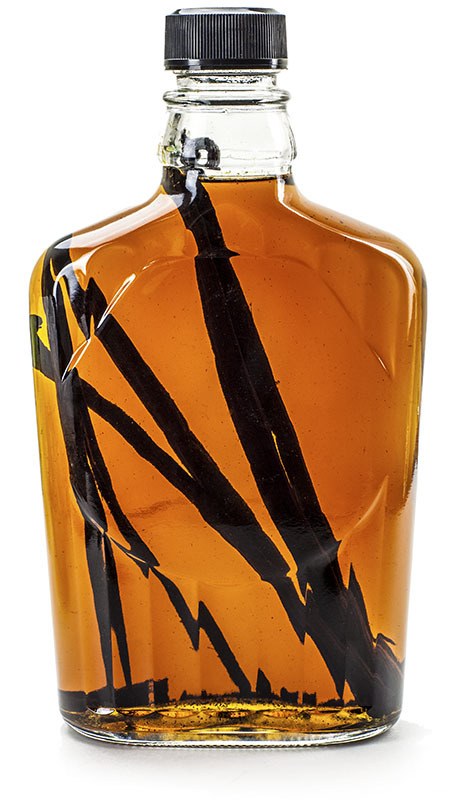 For a modest investment, you can make enough high-quality vanilla extract to last you for years. For another, you’ll know that it’s 100% real vanilla extract – no artificial ingredients or flavorings. And you can make your own custom vanilla blends by varying or combining different types of vanilla beans or alcohol. It’s also a very simple process: The only required ingredients in homemade vanilla are alcohol (the drinking kind, not the rubbing kind) and vanilla beans. The aromatic vanilla bean, once reserved for royalty, is among the costliest spices on earth, second only to saffron. Even now, after centuries of cultivation, vanilla is still relatively expensive, primarily because of the labor-intensive and time-consuming methods required to produce it. The price of vanilla is very volatile, in part because of continued political & social unrest in Madagascar, the major producer of high quality vanilla. Like everything, vanilla is subject to the law of supply and demand, and right now, the supply is down, while demand remains high. Vanilla is the only fruit-bearing member of the orchid family and is native to central Mexico. The ancient Totonac Indians of Mexico were the first to learn to use the fruit of the Tlilxochitl vine, vanilla pods. After their defeat by the Aztecs, they were forced to relinquish control of the exotic fruit. The Aztecs were, in turn, defeated by the Spanish, who returned home with the precious vanilla beans – which were for many years, enjoyed only by the nobility and the very rich. Eventually, the use of vanilla, while still quite expensive, became widespread throughout Europe. Thomas Jefferson is credited with introducing vanilla to the United States in the late 1700s. While serving as Ambassador to France, he learned the use of vanilla beans, and when he returned to the United States, brought vanilla beans with him. Vanilla is grown in several distinct regions of the world. This produces vanilla beans with unique regional characteristics and attributes, each particularly suited to different uses. Today, the three primary types of vanilla are Madagascar (Bourbon), Mexican and Tahitian vanilla, but vanilla is also grown commercially in Papua New Guinea, Indonesia, Fiji, Costa Rica, Uganda, India and China. Madagascar Bourbon vanilla is considered to be the highest quality pure vanilla available, typified by a creamy, sweet, smooth, mellow flavor. Madagascar Bourbon Vanilla is known for its “staying power”, which makes it especially suited to pairing with rich foods. Mexico, where vanilla originated, now produces only a small percentage of the harvest. But that doesn’t mean that genuine, high-quality Mexican Vanilla is inferior to other varieties. While inferior, adulterated vanillas have given Mexican Vanilla a bad reputation, the real stuff is superb! Tahitian vanilla, grown from a different genus of vanilla orchid (Vanilla Tahitensis Moore), is flowery, fruity and smooth. Long a favorite of professional bakers and pastry chefs, Tahitian vanilla is known for its aromatic, fruity, cherry, anise-like flavor profile. Tahitian Vanilla has a particular affinity to fruity flavors such as fresh fruit and fruit compotes, fruited yogurts, sorbets and fruit toppings. Vanilla might seem to be an odd flavor to pair with savory ingredients, but when used with a light touch, it adds a subtle, but delicious note to the naturally sweet, rich flavor of the pork, fowl and seafood, especially lobster, scallops and prawns. Take 4-5 whole vanilla beans, split lengthwise and add to a pint of 35% or higher alcohol content (that’s 70 proof or greater). Any type of alcohol can be used, but vodka is often used because of its neutral flavor. However, bourbon, rum, brandy or cognac are also popular and can add additional nuances of flavor to your own custom blend. We decided to use Golden Barbados Rum, which adds a wonderful flavor and aroma to the mix. Age for at least 8 weeks to allow the volatile compounds of the vanilla to become fully infused into the alcohol. After this point, the beans may be removed, but if left in the bottle the flavor will continue to deepen and evolve in intensity and complexity. Just be sure to keep the bean completely submerged in the alcohol. The resulting extract will last for years in a tightly sealed container. As an added bonus, after your extract has finished aging, you can remove the spent beans, air-dry them, and add them to a jar of sugar to make your own vanilla sugar (great for baking).